1981 – Kaneko Koi farm. 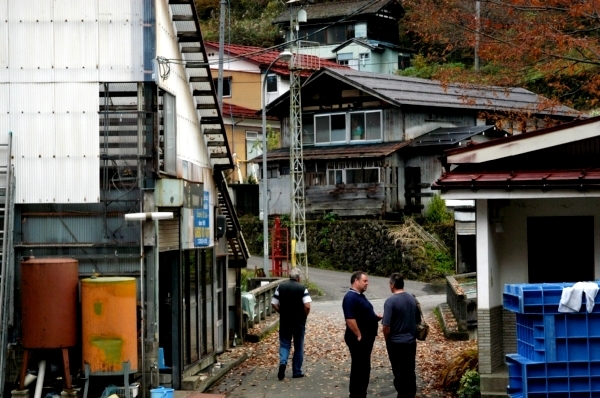 I was first taken here by Megumi Yoshida and the late Kozaburo Miya. It was a dark rainy night and at that time Komeii Kaneko was famous throughout Japan for his wonderful Kujaku. His farm is perched precariously on the side of a mountain stream in Nigorisawacho village and accessed by driving over a small bridge. In those days he was assisted only by his wife and they both welcomed us warmly. I bought several Koi there that night and later shared coffee and snacks with them in his small dwelling house just opposite his indoor Koi house. My first impressions were ‘warmth and friendliness’. 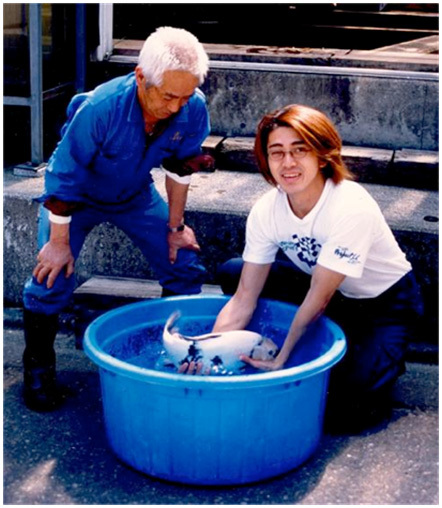 Father and son, Kaneko Koi farm, Nigorisawacho – taken 2001. The Shiro Utsuri was one I persuaded Kaneko to donate to the BKKS for an auction to raise funds.